December 31. Last morning in London. Last day of a strange year. Last BWIA flight to cross the Atlantic. Two hours of sleep and I’m up and ready to go. Heathrow on the M4. Road clear but winter late dawn darkness. No sign of fog, man on the Beeb says mild day today. First in the line. They forgot my veggie meal. Again. No worries. Waiting. Again. 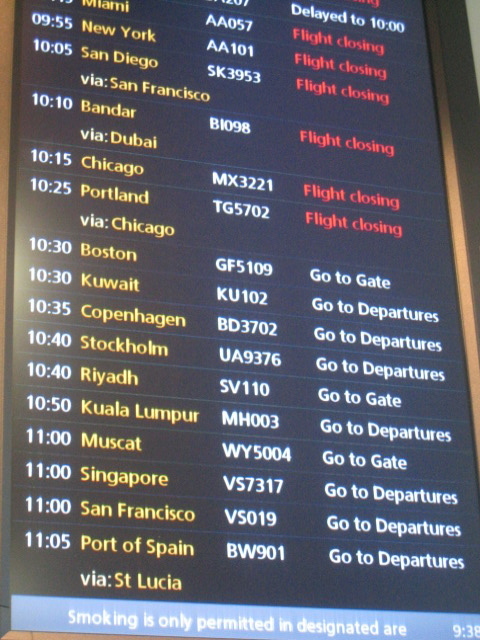 The flight’s delayed by an hour. After 66 years, nearly flawless flight record. My first BWIA flight around 2 or 3 I asked my mother if we were going to meet Jesus. My first flight to London around 7 holding tight to my sister with one hand and my teddy bear in the next. Ears popping, numb boomsie, eyes puffy to leave behind my granny, flight interminable. Peeping through the window and seeing the boxy greenness of the English country side. Back home a year later, with my teddy still clutched tight and a bit of an accent. I clap with the other people when the plane lands in Piarco. Home. Safe. More times. More travels. Beyond the BWIA boundaries. Missing the pan on the playlist. Missing the haughty, well made up BWIA girls. Missing the strange people sitting next to me. Excited tourists, bored students, old tesses going back home for the first time in decades, Trinis like me yearning for sun and wining and Caribbean Beat magazine. Pass through security. First time I have to take off my shoes in Heathrow. First time I have to shove everything into one piece of hand luggage. First time I feel sad to be leaving London to go home. Proceed to Gate 19. Trying to keep up with speeding nephews. They stop by a window. Typical London bleak. They look at the plane. They speed off again. I look at the plane and suddenly I feel a little sentimental. I try to get them to pose for a shot and they resist until I find something to bribe them with. Exasperated, why do you want a picture of the plane? Because it’s the last time one of these will leave London Heathrow. Late. It’s the last time I’m sit here in one of these departure gates rolling my eyes because of the delays. Inside passengers mill around. Flight attendants on the far side of the room. Some look bored. Some are bright eyed and perky. Some look like they’re sad to see the old tin cans go. Bepping in Gate 19. The man says time to board. A snazzy looking Oma Panday sashays down towards the plane. A tired looking Silver Fox brings up the rear, smiling all the way. Some things never change. Welcome aboard. Find seats. Pan on the playlist. Haughty well made up BWIA girls bringing me sorrel. I read myself in the Caribbean Beat and finally my nephews fall asleep holding my hands. Flight interminable, numb boomsie eyes puffy from wild nights in London. They find me a veggie meal. Sun setting as we fly west. Lower and lower almost there. Crane my neck to see the lights of the East West corridor, northern range dark and mysterious like the contours of a sleeping giant. I peel off layers. The tires hit the tarmac. A tear filled voice comes on the PA. Thanks for the support, thanks for 66 years of service. A smattering of applause. Gold toothed Indian behind me laughs a rum-soaked laugh and pelts some pecong behind the man who sounds like he wishes that BWIA could get a las lap. One more jump with a steelband down to Roxy roundabout. Usually I pelt out of a plane. Eager for real air, eager for that Piarco heat to hit me like a wall. I linger a little longer, saying goodbye to all the crew, feeling sentimental for a company that has vexated me frequently, that I have bad talked with gusto. Wondering what this new company will bring. Wondering if it will inherit BWIA jumbies, if it will be a serious grown up version of this child that took 66 years to become an adult. Piarco hasn’t changed. Hot and still looking like a cow shed. Waiting long for the bags to come. Amen aloud when we have them all. BWIA girls, make up still astonishingly flawless, sashay past. I give them the ‘alright’ head nod and smile. I hope they lose none of their haughtiness. I got the news about this early on a cold Christmas morning in ye olde Hinglan. Over breakfast I could hardly speak, for the tears threatening to spill out onto my cheeks. relief and frustration and happiness and anger. It’s taken me four days to be able to begin to put my feelings into words. I am pleased. I feel vindicated. It’s not easy to spend a year of your life doing and saying things without a surety that these things will bear any fruit. it’s not easy to win and lose friends and loved ones when you choose a battle that is bigger than you. A couple nights before, I sat in my sistren’s kitchen in Islington expressing doubts and fears about life, about being so presumptious as to call myself an activist. about trying to be a writer in a country where people don’t particularly like to read. about choosing to fight instead of running away. about the insecurity of being a tree hugger working for a pro-business newspaper. about the lonliness of women who take on the system. about not being taken seriously at times. and not being sure that any of this was for anything at all. about if I would have the strength to continue or if I should just pack my georgie bundle and head back into the loving arms of babylon-don. looking back on the year i’ve had, the highs and many lows. The private self-doubt that I manage to subvert enough to find confidence in front of a camera. it’s been an interesting ride, all of it, but I’m really glad to leave 2006 behind. On now to 2007, more adventures, more struggles, more triumphs, more laughter. A month ago my mother, who still bears the scars of her own involvement in 1970 and still mourns the deaths of Walter Rodney and Maurice Bishop and too many others, told me that I had done my job regarding the consistent opposition to the smelter and giving solidarity to the frontline communities well. This was after months of warning me, trying to protect me, admonishing me to remember that all activists have a problem with maintaining balance in their lives. And I would nod and say yes, Eintou absent mindedly even as I rushed out of the house at six am without breakfast to go and plant trees in Union. So it’s no small compliment coming from her. Which is not to say that she hasn’t always been completely supportive of my talents, no matter how hidden they’ve been under my considerable flakiness. However I feel as if I gained her approval in a way that holding down a job and being able to buy a house wouldn’t have done. I guess she suffers from that classic need to shield her children from a similar fate of loneliness and exclusion. I try to convince her that she’s done enough of a good job in shaping my mind, that she should leave me room to fight my own battles. She says I have nothing to prove to anybody. I say I have everything to prove to myself.